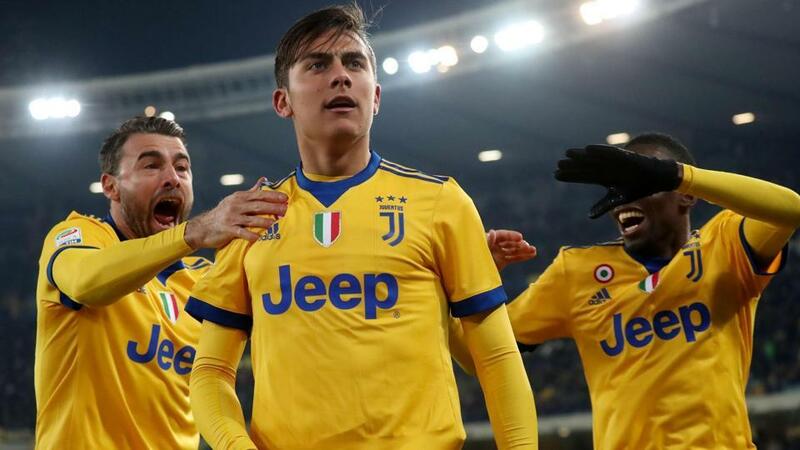 Paulo Dybala scored a brace as champions Juventus won 3-1 at Verona to keep pace with Napoli as Serie A’s leading duo pulled clear of pursuing Inter Milan, Roma and Lazio on Saturday. Napoli won 1-0 at Crotone on Friday to secure the symbolic title of winter champions as they top the table halfway through the season with 48 points from 19 games, one more than six-time defending champions Juventus. But behind them Inter, Roma and Lazio all failed to win. Dybala pulled the Turin giants level on 72 minutes and five minutes later sealed the win -- both goals with his weaker right foot -- to give him 14 league goals for the campaign. “We all know it was not a good performance,” said Juventus coach Massimiliano Allegri. “We put the victory at risk after a strong start, because we slowed down, made far too many mistakes, lost the ball repeatedly, and we need to improve on that. “It’s important that Paulo found the net again. He was in a delicate moment where things weren’t quite going his way. Third-placed Inter are seven points off the top after they were held to a goalless draw by Lazio at San Siro, as Roma, in fourth, drew 1-1 against Sassuolo in the capital. Inter’s draw saw them end a run of three straight defeats in all competitions, but after a storming start to the season Luciano Spalletti’s side have taken just two points in four games. Despite being dangerous in the first half, with Ivan Perisic denied by a stunning Thomas Strakosha save and a Borja Valero header hitting the post, Inter could not find a way past fifth-placed Lazio. “When you lose two or three games and go out of the Coppa Italia, it’s natural that those who wish you ill or hope that you’ll go back to old ways of previous years will come out of the woodwork,” said Spalletti. “I’m not an optimist as such, but I know that if you’re pessimistic, then you won’t get the result. I try to give my players confidence in themselves. Roma’s Lorenzo Pellegrini scored against his old club Sassuolo just after the half-hour only for Simone Missiroli to level after 78 minutes at the Stadio Olimpico. AC Milan remain in 11th -- 23 points behind Napoli -- despite a 1-1 draw at Fiorentina secured thanks to a Hakan Calhanoglu equaliser. Benevento, meanwhile, made history as they claimed their first victory in the Italian top flight thanks to a Massimo Coda strike on 64 minutes which earned a 1-0 win at home against Chievo. Roberto De Zerbi’s side sit bottom with four points from 19 games -- their only previous point coming in a dramatic 2-2 draw against AC Milan earlier this month. “It’s an important win because it would not have been easy for me to get back to work on Tuesday trying to motivate 25 people,” said De Zerbi, whose side are still 11 points from safety. Elsewhere Fabio Quagliarella got two stoppage-time goals as Sampdoria beat SPAL 2-0 with Cagliari winning 2-1 away to Atalanta and Udinese beating Bologna by the same score. Torino were held to a goalless draw at home by Genoa.